This is a sponsored post written by me on behalf of Sun Life Financial. All opinions are 100% mine. I celebrated a milestone this year – my 40th birthday. I don’t feel 40 and I often wonder where the time has gone. I’m still the same person I was in my 30s, but I noticed a few changes. The first change is that I’m taking better care of myself by eating better, exercising, and making sure I’m getting enough sleep. The second change is that I’m more mindful about my health. I hate to say it, but I’ve been googling health symptoms when I know I shouldn’t be. It’s SO hard to find credible sources of health information online. When you find a site you trust, bookmark it! I recently discovered a bookmark-worthy site that recently launched in Canada. Sun Life has a new digital health community that is exactly what I’ve been looking for. 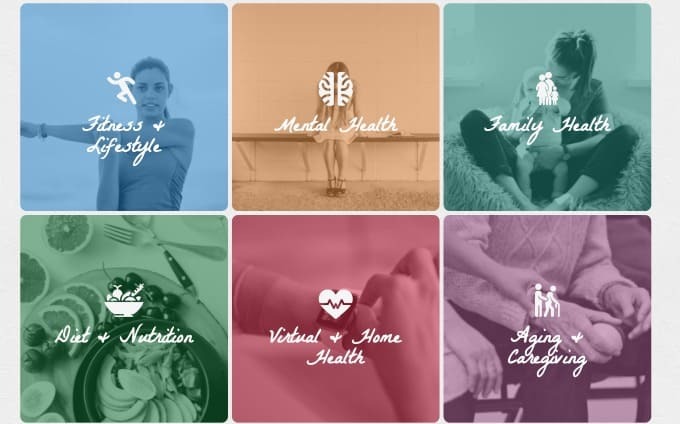 Their goal is to help Canadians live healthier lives by sharing various health-care options and information and also helping them to connect with others on their health journeys. I’m interested in all these topics so I spent a bit of time clicking around seeing what each one was all about. I suffer from anxiety so I wanted to see what was in the Mental Health topic. I found a variety of relevant, informative articles to read including many related to anxiety. I liked that people had rated the articles by giving it a thumbs up (or thumbs down). After you read the article, you can also give it a rating to help out in the community. They also have a Discovery Lab where you can find related health and wellness apps products and services. I noticed that many had special discounts and offers, too. It’s hard to know online what is good (and what isn’t) so it’s nice to get recommendations like this from a trusted source. I found a guided meditation app that looks really good. I need to learn how to relax more! You can also easily search through the articles by typing in a keyword and filter search results in the Discovery Lab. The site is easy to navigate and makes for a great user experience. Being equipped with the right health and wellness information is important and it’s easy to do in the digital age. You don’t even have to leave your living room couch! I encourage you to visit the new Sun Life digital health community and explore all it has to offer. I think you’ll be impressed with what you find there!